When it comes to planning your wedding, you typically want to stick to your budget in every part! After hours of planning and pinning, you finally get to your floral consultation to only find out… it’s way out of your budget! OKOTA often gets a lot of questions regarding flower costs and confusion over the details of figuring out a budget. So we decided to break down different parts of what wedding flowers REALLY cost, and help you save, so you can plan your day even better! There is technically no limit on how much you can spend on flowers! This is both wonderful and dangerous if you’re on a budget though. Typically you can expect to spend around 7-8% of your wedding budget towards florals and arrangements. Most times, however, couples end up spending more than their budgeted amount. Make sure you talk about it beforehand to avoid any confusion! Remember to keep in mind if the flowers are in season or not and the type you’re looking at. For example, a peony takes two years to bloom, so naturally, it’s more expensive, along with orchids and calla lilies. However, the bright side of bigger flowers (like peonies) means that they will fill centerpieces and other arrangements more, and make them look fuller. Keep in mind that those beautiful Pinterest bouquets you see typically have peonies, ranunculus, orchids, and garden roses, which make them VERY expensive, even though they look gorgeous! Aside from the type of flowers, the type of arrangement affects price too. The size and type of your bouquet, bridal party, and how far the flowers travel to get to you can affect what you will spend. For example, tight rounded flower-dominant bouquets are much more expensive than loose natural bouquets with lots of greenery. 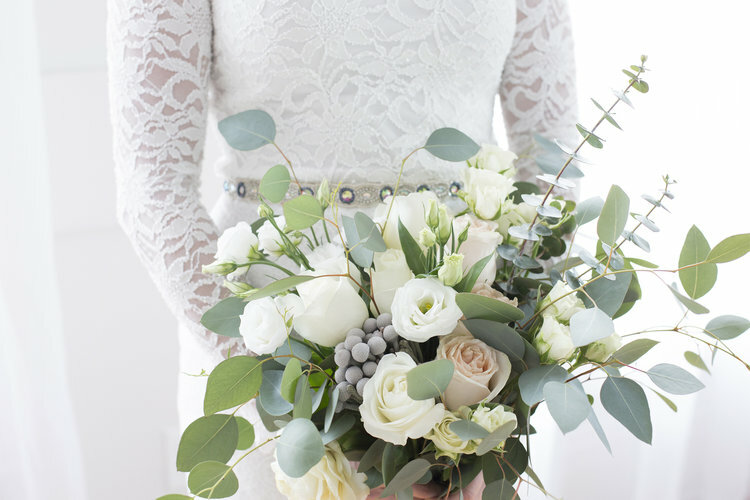 Greenery itself can help cut the costs because it adds a fuller look to your bouquet and arrangements! You may not think of this, but it takes some (and a lot of it) to assemble floral arrangements. Depending on what the arrangement is, it will affect how much you pay in the end. The more complex, the more time it will take! Also note that certain items, such as flower crowns and garlands, also take more time because the assembly is much more intensive than others. They really do look beautiful; just make sure to remember all the hard work that goes into making them. There are SO many options for your reception centerpieces, from clean and simple to overflowing and extravagant, it seems obvious how this can easily push your flower costs up! If you’re going for something modest, a little greenery and candles can make a beautiful table centerpiece over a tall arrangement. However, if you have more of a statement in mind, you can always alternate short and tall centerpieces to save money. It also gives your tables variance while looking just as beautiful! When you’re planning out your wedding flowers, keep in mind these factors and how they will affect you! As always, talk to your floral designer to see what ideas they may have to help you get the look you want in the budget you have. 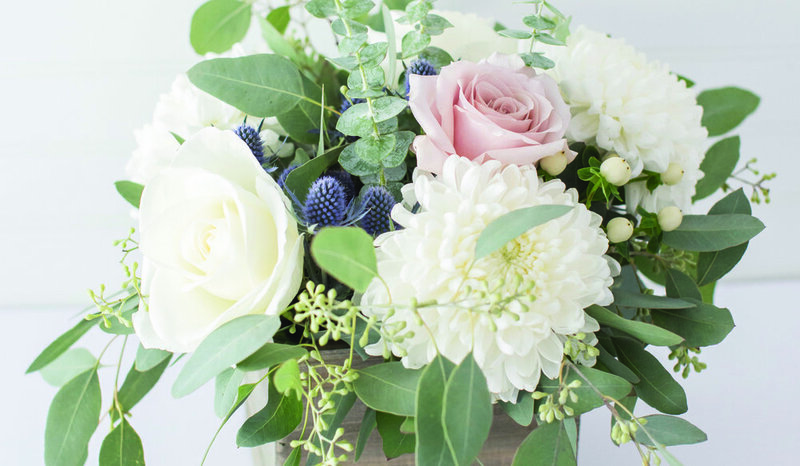 If you're interested in a floral consultation with OKOTA, schedule a consultation or fill out our quick online form!